This cheeky little elf will charm your guests with her skillful and mesmeric crystal ball manipulation. Audiences from across the world have been drawn to the compelling sight of her crystal balls, which glide, float, and dance gracefully around her hands, arms and body as if they have a life of their own. A magical contact juggling act that must be seen to be believed. 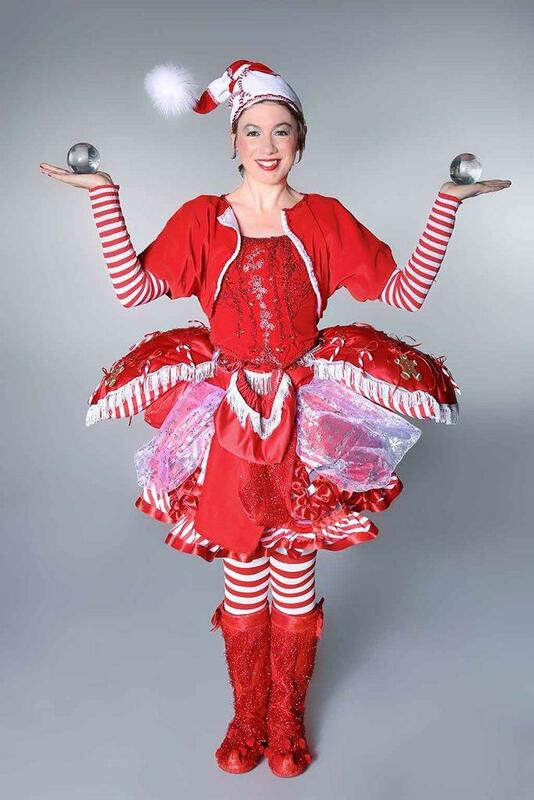 Candy Cane Elf Contact Juggler is perfect for Christmas events where themed acts are sought after and ideal for meet & greet, roaming and table entertainment. OMG you were amazing! Thank you for making our event so special – I would love to book you again. A massive thank you for coming to our event. You wowed everyone with those crystal balls! The event was a great success. Karine was great, the guests enjoyed her. It was something new for them, so they were certainly intrigued! Karine was polite & professional, and I would be grateful if you could pass on our gratitude to her.